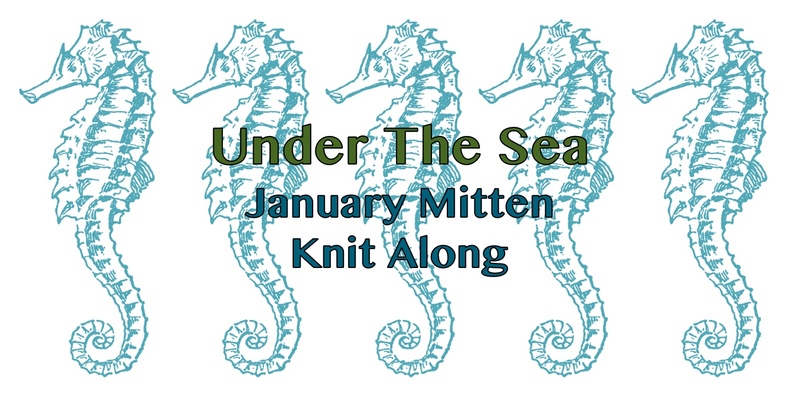 January is National Knit Mitten Month and to celebrate we’ll be having a mitten knit along! Here are a few details…. I am using 3 colors of yarn, you want the colors to have enough contrast so you can tell them apart when knit. I am using Knit Picks Palette in Calypso Heather, Green Tea Heather and Raspberry. You could also so this in 2 colors, but I think three is more fun. Tonal or a yarn with long color changes would be beautiful in this pattern. I do not recommend using hand painted or yarns with lots of quick color changes, because the details of the pattern get lost. You can read a little more about picking your colors in the planning thread. You’ll need approximately 34g/158yds of your main color (blue for me), 23g/107yds contrast color 1 (light greenfor me) and 6.6g/31yds of contrast color 2 (coral pink for me). This is based on the 7.5in size, the larger size will require more. Gauge is 10 stitches and 12 rows per inch. It is important to get gauge to get the right size! The mitten will be available in three sizes, 7”, 7.5” and 8” wide. Clues will be released on Monday Jan 2, 9, 16 and 23, 2017. Clues will be released here and you’ll find links on the Ravelry forum and pattern page. All you have to do to join is start knitting with us on January 2nd! Join our group on Ravelry to keep up on the clues and chat. 2 years ago by Kat in Knitting , Knitting Socials , Needlecraft | You can follow any responses to this entry through the RSS feed. You can leave a response, or trackback from your own site. Which of the color choices should be used when working with the tonal yarn? Would it be the MC, CC or CC2? It could really be any, but I thought a blue tonal as the mc would be especially pretty as I think of it as the ocean.